Getting tired of trips to the dumpster and landfill? Think there must be a better way to manage all the construction and demolition waste you face on job sites? Well...then you should join EcoUrban next Wednesday for a deeper look at the current situation and what can be done to increase landfill diversion and developing opportunities for profiting from construction waste. The St. Louis Region and the Midwest are blessed with much open space, which means that it is easy to overlook where our generated residential and commercial waste ends up. Our landfill tipping fees, i.e. 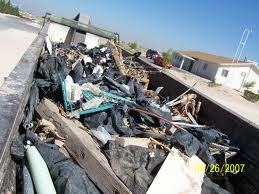 “the cost to dump”, are relatively low compared to other parts of the United States as a result of the abundance of landfill areas. Many consumers, businesses and contractors think nothing of throwing things “away and out of sight.” However, it is not environmentally responsible to dispose of items that could be salvaged, recycled or reused. It is also irresponsible to think of our landfill space as unlimited. One day there will not be an “away” for our waste disposal. With support from St. Louis Jefferson Solid Waste Management, USGBC-Missouri Gateway Chapter, ReSource St. Louis and Missouri Enterprise have partnered to address the need to better understand C&D waste resources in the St. Louis area and build a business case for increasing waste reduction with the ultimate goal of reducing waste in our landfills and preserving the environment for future generations. Join us for a free educational seminar on the State of Construction & Demolition Recycling in St. Louis. Acquire a comprehensive background on the present “lay of the landfill” as it relates to common and existing practices for dealing with C&D end of project materials. Identify current best alternative practices for dealing with C&D materials in the greater St. Louis area, encouraging a shift away from current dead-end strategies. Examine the recycling needs of the building community, as they relate to LEED requirements and personal best choices. Capture and expand upon possible business case options as they relate to LEED requirements and personal best choices. Explore barriers to C& D recycling, dispelling the myths and offering sound metrics to encourage an embracing of recycling as opposed to dumping. Recognize national case studies of technologies and approaches already in place elsewhere which provide significant monetary and environmental savings to communities and states. Thanks to the Project Team who managed the focus groups and developed the C&D Toolkit and this Education Session!